In this Dec. 15, 2017 file photo, President Donald Trump, left, sits with Attorney General Jeff Sessions during the FBI National Academy graduation ceremony in Quantico, Va.
“Come on Jeff, you can do it, the country is waiting!” Trump wrote on Twitter. His exhortation followed a remarkable public war of words Thursday between Trump and the former senator from Alabama, whom he appointed to lead a Justice Department that is now conducting multiple investigations related to the president and his closest associates. But Trump then ticked off a list of issues that he said Sessions should be investigating, including Hillary Clinton’s use of a private email server as secretary of state; the alleged “lies & leaks” of former FBI director James Comey; the alleged “conflicts” of special counsel Robert Mueller; the anti-Trump texts sent by former FBI officials Peter Strzok and Lisa Page; and the alleged “illegal surveillance” of Trump’s campaign in 2016, a claim that has been largely discredited. Trump called that “small potatoes” compared to what Clinton had done regarding her email server, an issue that was investigated by the FBI that led to no criminal charges. “So unfair Jeff, Double Standard,” Trump wrote. Trump’s tweets come amid a relentless attack on Mueller’s ongoing investigation into possible coordination between Trump’s campaign and Russia in the 2016 election and whether Trump has obstructed that probe. Earlier this week, the Justice Department secured a guilty plea from Trump’s former lawyer, Michael Cohen, and a guilty verdict against his former campaign chairman, Paul Manafort, on charges that surfaced amid the investigation but were not directly related to Russian election interference. Cohen pleaded guilty to charges that included campaign finance violations stemming from payments to two women to remain silent about alleged affairs with Trump. Manafort was convicted on fraud charges related to work before he joined the Trump campaign. 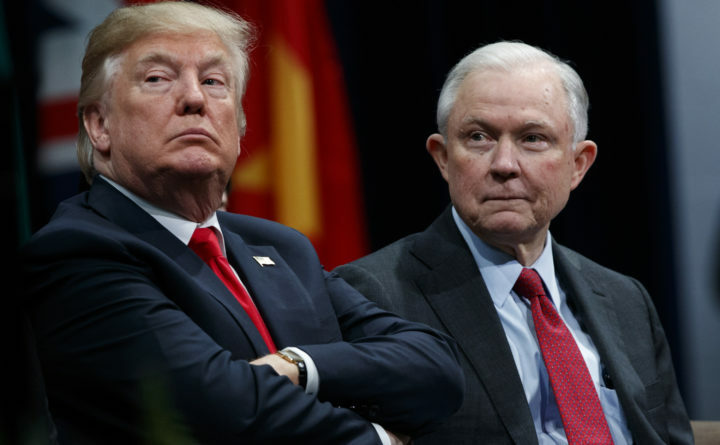 On Thursday, speaking to the Fox News Channel, Trump said that Sessions “never took control of the Justice Department” and again faulted him for recusing himself from the investigation of Russian interference in the presidential campaign. “What kind of man is this?” said Trump, who also asserted that he appointed Sessions as attorney general only because of the loyalty that the then-senator demonstrated during the campaign. That prompted the statement from Sessions defending his department and pushing back against attempts at improper political influence. During the Fox interview, Trump declined to say whether he plans to fire Sessions, a move that even some Republicans have cautioned Trump not to make.